Mark’s been wearing winter jacket for years now. 1998 maybe? He bought it on sale at JCPenney’s — it’s got the Olympic rings on the back, and I think it must have been for the 98 Winter Olympics. Were there Winter Olympics in 1998? It’s not his only winter jacket, but it’s a favorite. It’s green and black and purple denim, lined, very warm. And it’s in amazing shape, really. But then, he takes really good care of his stuff. He’s kinda scary that way. Last spring, at the end of the heavy-jacket wearing season, he showed his jacket to me with a little bit of horror. There was a rip in the lining of one of the sleeves — he’d put his hand right into the rip. I told him I’d be happy to patch it, and promptly stuck it on the back of my sewing chair, where it became part of the scenery. Every so often he’d say something about it, but since Jacket Wearing Weather was months away, I was in no hurry. His comments and questions have gotten more frequent as the weather has gotten cooler, and, I finally decided that I’d better patch it before he started to think I didn’t care. I have known right from the start how I was going to patch it, and all told it probably only took me 30 minutes to do. An hour at the outside. Why do I put jobs off? I was sure it would take ages to do. I used a little bit of fusible interfacing on the inside of the tear to hold the edges of the rip together. 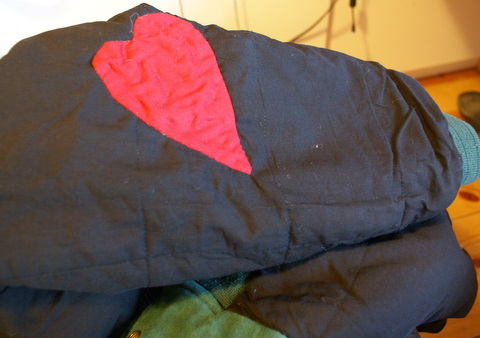 The heart is two layers of cotton fabric and a layer of the fusible interfacing, sewn together so that I could turn the fusible to the outside and tack it down while I hand-stitched the heart in place. He rolled his eyes a bit when he saw it. I reminded him that no one is going to see him, and only he and I (and now my blog readers…) will know that he is wearing my heart on his sleeve. Maybe that’s what I should have done with Chris’ hunting pants! He’d never ask for another repair on his clothing! LOL! Both adorable and vomit inducing at the very same time. LOL.